The Melbourne International Lesbian & Gay Film and Video Festival began in February 1991 opening with “Longtime Companion” at the Dendy Brighton Cinemas. Other screenings over the weekend took place at the National Theatre in St Kilda. It was originally as part of the Midsumma Festival. In response to the New Wave of Queer Cinema emerging at the time, the Midsumma board asked film maker Lawrence Johnston and lesbian identity Pat Longmore to be the first Festival Directors. It drew good audiences and was a marked success. The 1992 Festival screened at the State Film Theatre (Treasury Place). In September 1992, Madeline Swain and Suzie Goodman came on board. The festival became an incorporated association and it was moved to March under the name Melbourne Queer Film and Video Festival. Those early years were a tough struggle. Tamara Jungwirth recruited as Festival Director and eventually the festival established itself. In 1995, we started Movies Under the Stars, screening classics in a picnic atmosphere at Fairfield amphitheatre. As it grew, the festival did much to assist the spread of access to queer cinema throughout Australia. In 1996, a touring program went to 5 interstate capitals including Hobart where homosexual activity was still a crime. The festival is proud to have played a part in the establishment of queer film festivals in Brisbane, Bendigo, Far North Queensland and in NSW. In 1997, Claire Jackson became President. In 1998 City of Melbourne came on as supporter through their arts grants. Lisa Daniel joined as Festival Director for the 1999 festival and a period of rapid growth began. 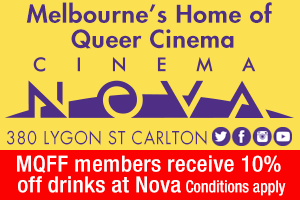 In 2003 the name was changed to Melbourne Queer Film Festival and in 2004 the screenings moved to the excellent facilities at ACMI except for the fabulous opening nights staged at the iconic Astor. The festival was able to host its audience in a lounge staffed by our famous volunteers creating the perfect safe and welcoming environment. In 2010, following our biggest audience ever, we expanded screenings to Greater Union on Russell Street. In 2011, MQFF headed west to the Art Deco splendour of the Sun Theatre to start our first satellite festival over a weekend in late August and brought our opening night into the city at ACMI in 2012. What began in the back room of Hares and Hyenas almost 30 years ago has become a leading international queer film festival and a beloved favourite in Melbourne. MQFF will continue to work to give its audience access to best in world queer screen culture and incubate local talent. We are always looking at how we can bring you even more LGBTIQ+ cinema throughout the year, including outside of Melbourne… so stay tuned!